Welcome to your Iota Omicron Chapter's website! This site provides you with the ability to network with chapter members, upload photos, share documents, participate in chapter discussions and learn about chapter events. You are being invited you to participate in development of content for a workshop focused on helping students nearing their graduation to deal with difficult encounters they may experience with other health professionals as they prepare for their transition from their student to professional practice roles. You are being invited to participate in an individual interview in person or by phone to share an experience when you felt a conflict, felt bullied or disrespected by another health professional in your early practice. You will be asked to participate in an individual interview with one of the research team members for about 30 to 45 minutes of your time in a location that is mutually acceptable to you and the interviewer. You will be asked to discuss the situation you encountered during your interview and asked for permission to audiotape it and have a transcript from the interview prepared. You will have an opportunity to review the transcript to ensure it is both accurate and also free of any information you feel may cause you to be identified. Your identity will be protected by a pseudonym and any identifying information will be removed. The information that you share will be incredibly helpful to help prepare students about the types of difficult situations they may encounter. They will also be provided with some strategies that are expected to assist them in coping with future difficult encounters. Attached to this email, you will find a letter of information to help you understand your role in helping with this study. 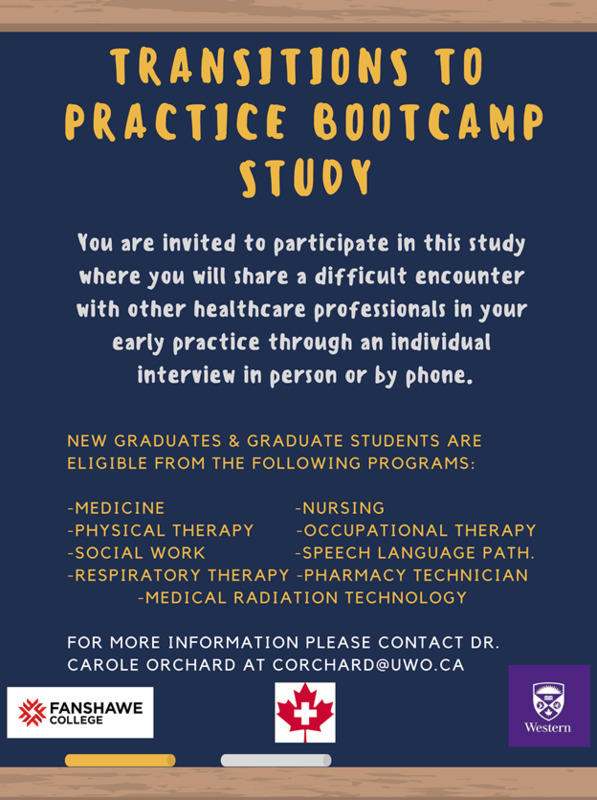 If you wish to participate in an interview with a research team member please send an email to Dr. Carole Orchard, corchard@uwo.ca. We hope that you are able to assist us in sharing at least one incidence of a difficult encounter with another health professional that remains meaningful to you. Join Iota Omicron as a Nurse Leader Today! Did you know you can join the Iota Omicron Chapter as a Nurse Leader? Head to our "How to Join" page for more information and to access the application!